KOKOMO, Ind. – News did not take long to spread, and as it did, it brought a city to tears. Phil Cox, an adopted son in the City of Firsts, unexpectedly passed away on June 19 at the age of 64 following an illness. 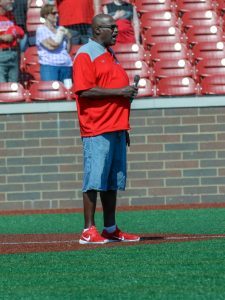 Cox arrived in Kokomo in 1986 as an assistant coach on Basil Mawbey’s Wildkats basketball staff, and for 32 years, he molded young men into boys while leaving a legacy that is as big as his smile and as deep as his booming voice. Cox gained fame across the state as the 1972 Indiana Mr. Basketball – a title he earned after leading Connersville to the boys basketball state championship. The title bout, played at Indiana University’s Assembly Hall, was also noteworthy because Cox, dressed in his game uniform, sang the National Anthem minutes before winning the opening tip and scoring the first basket of the game. While at Connersville, his singing voice earned him gold medals in choir while his athletic abilities took him to a third-place performance at the IHSAA state track meet in the high jump. But with all of the accolades he received at Connersville, he found a home in Kokomo with his wife Darlene. The impression he left was immense – from the halls of Kokomo High School where he was an attendance officer to Mount Pisgah Missionary Baptist Church where he was an associate minister. His influence in the halls of Kokomo High School helped shape the lives of hundreds, maybe thousands of students, many of whom returned to Kokomo – including current Assistant Superintendent Mike Sargent and Wallace Elementary School principal and outgoing Athletic Director Jason Snyder. Current girls basketball coach Troy White recalls his relationship with Cox. Two newcomers to the Kokomo community asked Cox to join their boys basketball staffs following the departures of previous coaches. Many turned to social media to talk about what Cox meant to them. Tributes and condolences poured in from across the state and around the nation. “We are very saddened to hear of the passing of Phil Cox. He was a great athlete and coach, but more importantly a great man, mentor, and friend to so many in Howard County,” tweeted the Eastern athletic department.